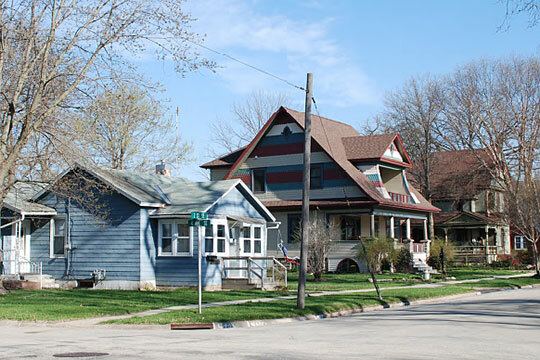 Photo: Homes on 2nd Avenue SE, Old Fourth Ward SE Historic District, Waverly, IA. The Historic District was listed on the National Register of Historic Places in 2013. Photograph by Marlys A. Svendsen, Svendsen Tyler, Inc. for City of Waverly Historic Preservation Commission, 2011-2013, for nomination document, Old Fourth Ward SE Historic District, Bremer County, IA, NR# 13000922, National Park Service, National Register of Historic Places, accessed September, 2014. The Bremer County Courthouse is located at 415 East Bremer Avenue, Waverly, IA 50677; phone: 319-352-0130. In 1833, Bremer County  and surrounding area were ceded to the Winnebago tribe by the U.S. government in exchange for land in Illinois and $10,000. At the time of the first settlement in 1845, there were approximately 650 members of the Winnebago, Mesquakie, and Pottawattamie tribes living in the county. First settlers included Charles McCafree, Jacob Beelah, J.H. Messinger, George Tibbetts, T. Fisher, and P. Miller. In 1848, the Native Americans remaining in Bremer County were removed by U.S. government troops to areas west of Bremer County, and in 1850, a treaty was signed that included provisions moving the tribes out of the Iowa territory. Bremer County, which was named for a Swedish author, Frederika Bremer, was surveyed into townships in 1847, and in 1848 the first township, Jefferson Township, was divided into sections. And by 1851, the entire county was sectionalized and placed onto the market for sale or homesteading. The first community platted was Janesville and the plat was recorded on July 22, 1854. Development closely followed the platting of Janesville. Elections were first held in 1851, and public education began in a log cabin in Jefferson Township during the winter of 1852-1853. Higher education came to the county with the establishment of Wartburg College in 1879. The first newspaper, the Bremer County Herald, was printed in Janesville in 1855. Bremer County built its first courthouse, a 20 foot by 30 foot building, in 1854 at a cost of $147.50. As in many northeastern Iowa counties, the railroad had a dramatic influence on development in the 1860s and 1870s. The railroads offered a means of transportation for people, agricultural commodities, and other materials. During this era, the county was crisscrossed by the Illinois Central; Iowa and Pacific; and Dubuque; and Dakota Railroad lines. The communities of Tripoli, Sumner, and Plainfield were developed as railroad towns. During the 1920s through 1940s, the county made contributions to the war efforts and was economically affected by the Great Depression. The air station south of Waverly provided employment for military and service personnel and added to the economy of the surrounding cities of Waverly and Janesville. Today, the county includes eight incorporated communities that are separated by areas of land that is prime for agriculture. And while highways have picked up where railroads have disappeared, Bremer County enjoys access to a notable transportation network. The County Seat is located in Waverly in the southwestern part of the county. Education, family values, and a strong work ethic remain hallmarks of the residents of Bremer County. Iowa Northland Regional Council of Governments, Bremer County, Iowa Comprehensive Land Use Plan Update, 2003, www.co.bremer.ia.us, accessed October, 2015.